Calculated Risk is the first novel in the Rafe and Kama series. Their story continues in Hostile Takeover. 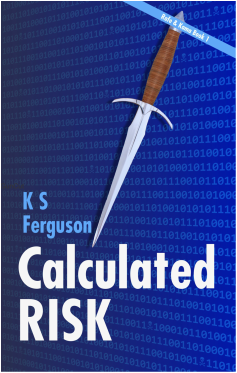 Calculated Risk is available at Amazon, Barnes & Noble, Kobo, iTunes, and Smashwords. Can you tell us a little about yourself? Who are you? What is your role in the story? Kama: Computer technician Kamala Bhatia, Oasis Corp.
Rafe (grinning at Kama): Or something like that. We've come to this mining station in the asteroid belt to find out why my brother-in-law, Leon Goldman, CEO at EcoMech, wants to purchase it. At least, that's why I'm here. Kama has her own agenda. Kama (leaning in): One we aren't talking about, remember? It's key to Oasis' plans that no one find out we're interested in this rust bucket. Rafe (clears throat): I joined Earth Force when I was 16, and left it at 21 to open my own company, Security Partners. Over the past nine years, I've grown Security Partners into one of the most successful privately-held businesses in the galaxy. Kama: Don’t be fooled by his expensive wardrobe and thousand credit haircut. If you think he's one of those soft corporate bastards, you haven't seen him take on the goon squad in hand-to-hand combat. Rafe: I owed Leon's father, Aaron Goldman, a favor, but I was leery about getting involved in anything to do with EcoMech. My father, one of EcoMech's founders, still sits on the Board of Directors. Kama: His family's a mess. They haven't spoken since the suicide of his wife fourteen years ago. His father is a piece of work. Kama: He's a workaholic. He doesn't have time for hobbies. Rafe: I admit I work hard. I play hard, too—scuba diving, windsurfing, swimming. Then there's the pickup soccer games, Alpine skiing, tinkering with flyers. What is the challenge you're trying to overcome during the story? Rafe: To catch a ruthless blackmailer. Kama: Liar. The real challenge is facing your father, who still thinks of you as a murderer. And not letting those sociopaths on the board twist you into one of them. Rafe: And getting Kama to open up to me. She sees herself as Robin Hood, hacking corporate computer systems to help the downtrodden. I’d like to know what drives her to take that kind of risk. Rafe (squirming): I’d stop my wife from murdering our children and committing suicide. Kama: If your father had treated you right, you wouldn't have married Youko. Married with three kids on the way at 16! That's insane. Rafe: After my mother died, I stole my father's shiny new flyer and wrecked it. I was 14. I'd been partying with other kids out in the canyons. I was depressed and wanted to die. I pulled the anti-collision chip from the flyer and did my best to splatter myself into a cliff face. I would have succeeded except that in my drunken stupor, I pulled the GPS instead of the anti-collision chip. I still wrecked, but not as spectacularly as I'd planned. My brother-in-law, Ben Nighthorse, figured it out. He made me promise I'd never try suicide again. He and my sister, Shannon, took me in. If not for his guidance, I wouldn't be here today.